The result of over a decade of study, this work presents in 423 pages a vast range of new material on a super-series of coins which uniquely bridges Hindu and Islamic India from the 7th century CE onwards; its interpretations open a whole new horizon in the numismatic history of early medieval India. 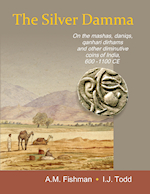 The book comprehensively examines the nature and historical context of the earliest native tiny silver dammas as well as all their various Islamic and Hindu descendants, traversing the early coinages of Sindh, Punjab and ancient Gandhara, as well as the later Sindhi, Multani and Ghaznavid types, and subsequent coins from north-western and central India, covering the period from about 600 to 1100 CE. 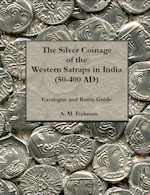 A survey of later coins from western, central and south India is included in the Addendum to the main work for the sake of completeness and to demonstrate the pervasiveness of the tiny silver damma over time and throughout India. Comprehensive descriptions, translations and historical notes are provided for every one of the hundreds of coin types, together with illustrations of one or more specimens of each, including line drawings where appropriate. Order the book here. This 392 page book is the most comprehensive study of the rich silver coinage of the Western Satraps ever written. The Western Satraps (also known as Indo-Sakas or Indo-Scythians) of Gujarat and the surrounding areas in Western India issued a plethora of beautiful rich coinage which until now has not been well understood outside of a small circle of specialists. 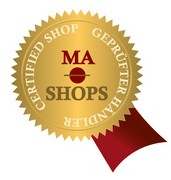 This is the perfect guide for the new or experienced collector. The coins of the Western Satraps (also known as the "Western Kshatrapas") were issued for over three centuries (from the 1st century AD to the early 5th century AD) and covered thirty eight rulers from two distinct dynasties (Kshaharatas and Kardamakas). Order the book here. 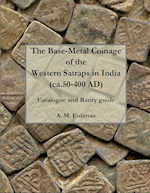 "The Base-Metal Coinage of the Western Satraps in India (50-400 AD), Catalogue and Price Guide", A.M.Fishman This is the brand new publication. This 216 page book is the most comprehensive study of the poorly known and understood base-metal (billon, lead, copper, bronze and potin) coinage of the Western Satraps ever written. The Western Satraps (also known as Indo-Sakas or Indo-Scythians) of Gujarat and the surrounding areas in Western India issued a plethora of beautiful rich coinage and sparse and poorly-studied base-metal coinage. This is the perfect guide for the new or experienced collector. The coins of the Western Satraps (also known as the "Western Kshatrapas") were issued for over three centuries (from the 1st century AD to the early 5th century AD) and covered thirty eight rulers from two distinct dynasties (Kshaharatas and Kardamakas). Order the book here.